137/365(+1), a photo by Luca Rossini on Flickr. Today I had my speech at the congress. I presented to a bunch of bioengineers and roboticians how the transcranial magnetic stimulation could serve as a novel tool for assessing the effects of robotic therapies on stroke patients. The room was more than half full. It wasn’t an easy presentation, we do not have any new data on the topic, so I had to make what I had as sounding as possible. I don’t know how much it worked for sure, but I didn’t get rotten tomatoes at least. A couple of researchers in the audience were interested in the topic and asked me later for some extra information. I was finally home at 7.30 pm, I relaxed with a couple of beers, then I left for my parents, with which I had dinner and watched the boring football semifinal between Spain and Portugal. On the way back I found a couple of nice spots, one of which is portrayed in the daily photo. 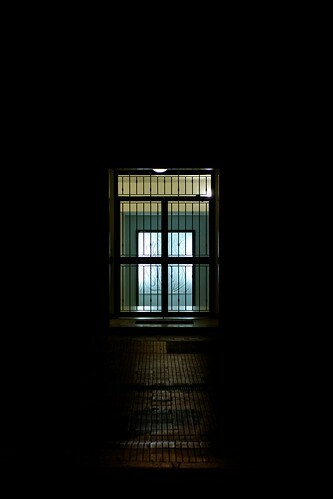 Another lonely entrance hall, lost in the darkness, almost sacral with it’s cross silhouette, silently but firmly defending the border between the ominous mysteries of night and the safe and sleepy intimacies of homes.